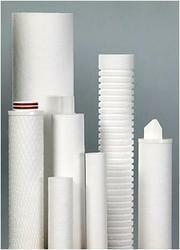 Offering you a complete choice of products which include Cartridge Filter such as Spun Filter Cartridge and Wound Filter Cartridge. • Length : 10", 20", 30", 40"
We, at Geo Enviro Solution, also offer PP Spun Filtration Cartridge where its core are constructed of thermally bonded polypropylene microfibers to ensure high efficiency. Incorporating a rigid polypropylene center core for increased collapses strength and durability, this thermal bonded micro-fiber construction have minimal fiber release, consistent flow rate and superior filtration performance. Having unique micro-grooves on surface area, they does not impart taste, order or color to the liquid being filtered, which make them ideal for food and beverage applications. Having a temperature limit of 40•F to 175•F ( 4.4•C to 79.4•C) also make them ideal in hot water applicationsand also provide superior chemical resistance. 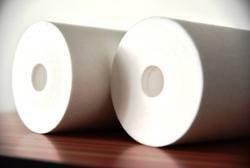 Available in different lengths from 10” 20", they also have various micron rating including 1, 5, 25 and 50-microns. 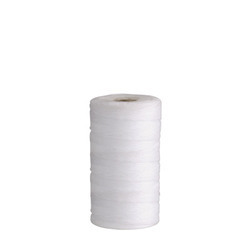 Manufactured from pure 100% polypropylene fibers, where fibers are are spun together to from a true gradient density from outer to inner surfaces, they actualliy accommodate all filtration needs. • Length : 10", 20"
Available in different lengths from 10” up to 40", they also have various micron rating including 1, 5, 25 and 50-microns. 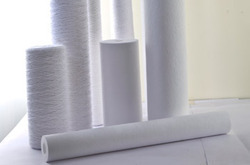 Manufactured from pure 100% polypropylene fibers, where fibers are are spun together to from a true gradient density from outer to inner surfaces, they actualliy accommodate all filtration needs. 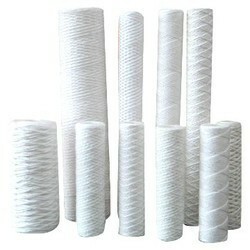 Looking for Cartridge Filter ?